✓Timer Fuction - Five different auto shutoff times of 30 Min,1H,2H,4H and 8H. ✓UV Lamp function - Kills germs, while the charcoal filter captures odors. ★ROME AIR PURIFIER FOR PETS - It removes 99.97% of allergies, dust, pollen, smoke, pet dander, filters particles as small as 0.3 microns and larger and filters air pollution of PM 2.5. Ions function helps to reduce odors and volatile organic compounds (VOC) at some degree, but ventilating would be the first choice. ★IMPORTANT - Package includes one filter and replacement filter is in stock now. Search B07FCJ1F2X to purchase it. Use INTEY technologies replacement parts to maintain product performance and warranty. The filter should be replaced every 4-6 months to ensure best results. ★NO OZONE - In the certification of CARB, INTEY air purifier is turned out to be completely no ozone. Also, ions function and UV-lamp can be turned off as your needed, it won't affect basic usage. 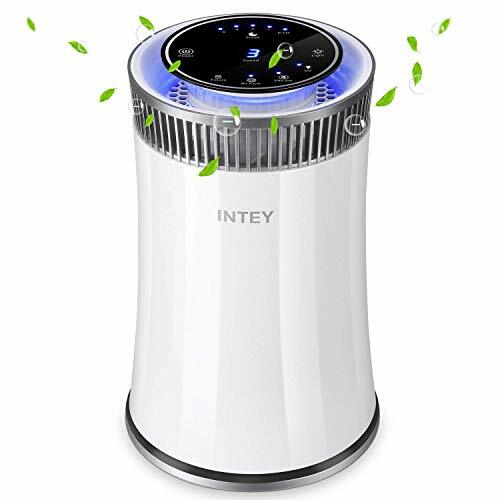 ★PORTABLE AIR PURIFIER - Keeping it on setting 1 during the night (with LED light ON/OFF), minimal noise with slow down fan. There's 5 speed for choosing, with a min noise of 32 dB and max noise of 56 dB(A). ★AUTO-OFF TIMER - Five different time for choosing ,as 0.5H,1H,2H,4H,8H. Allows people don't have to get up from chair/out of bed to turn off the machine,especially for seniors or forgetful person.